Home » Mid Century Culture » postwar culture » Analyzing details on a perfect, mid century Dutch Colonial — Royal Barry Wills design? 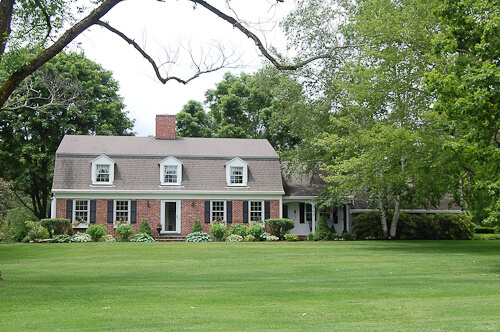 Analyzing details on a perfect, mid century Dutch Colonial — Royal Barry Wills design? The windows upstairs all have matching window treatments. They are beautifully proportioned to the scale of the front of the house, as well. These folks certainly take pride in their house: The window boxes all match and are all planted and ready to show all spring. 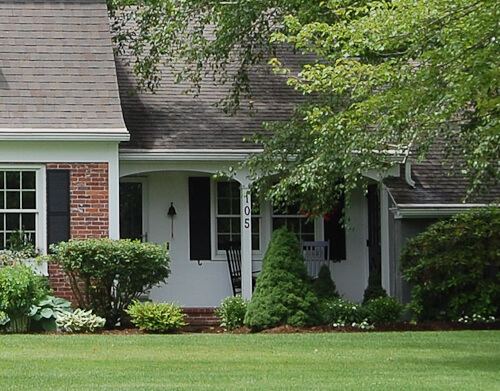 I love black shutters on a red brick house. The hostas add nice sun dappled color while still laying low. Also notice the nice hefty cornice (the white decorative trim running horizontally under the soffit of the roof above the doors and windows. I have been thinking about these mid century side porches — and similarly, breezeways — a lot lately. If you are going to add an attached garage — consider inserting one of these side porches with a mud room behind. Or, if you can handle the garage detached, insert a covered breezeways. You can make the cornice of the porch curved like this one…you might also consider trellis or ornamental iron columns. Brick floor… or concrete edged in brock. Windows with shutters and shutter dogs. Door to kitchen or mudroom must be low key / very subordinate to the facade of the house. That’s because it’s bad feng shui to have “two front doors” — the energy does not know where to enter, gets confused, runs screaming. Here is the side porch idea when it is executed as a breezeway instead. I adore adore adore breezeways and side porches for mid century modest houses. Don’t forget the Early American bell. See that teensy thingie on the bottom of the shutter — that’s the visible half of Shutter Dog, wrought iron hardware meant to hold the shutter in place, even if only decoratively. Now this is particularly delicious — the attached garage (I think it is a garage…). 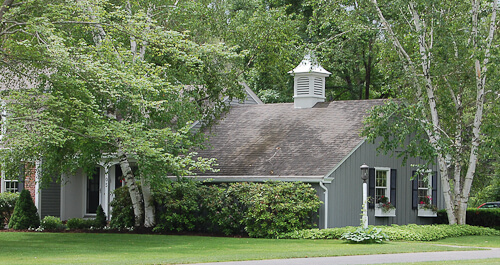 Of course, dig the important cupola — a hallmark of mid century Early American architecture — . I’d say, the bigger the house, the bigger you can go with the cupola. Window boxes match those on the front. Lovely post lantern marking the entry way to the front door. The siding on the garage is board-and-batten — and grey. 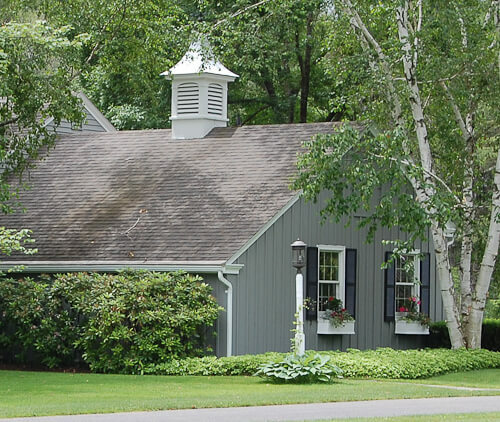 Note, however, that the siding on the porch is different (clapboard?) and white. 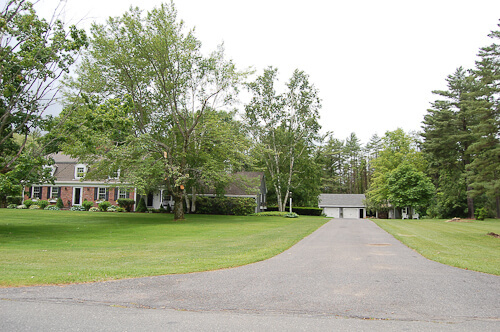 This is a classic design trick, too, on these mid-century American Colonial Revival homes. Break up the long low, and consider adding visual interest, by mixing your materials. You have to be careful not to overdo it, or get clashy, though. 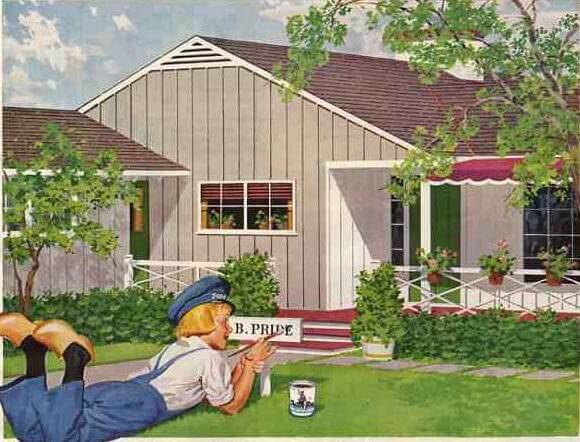 Reminds me of this 1952 Dutch Boy paint add — here’s more board and batten siding. Hoever they have done the contrast with paint – did not change materials. Here is a little closer up. Carriage doors on the garage are just right. 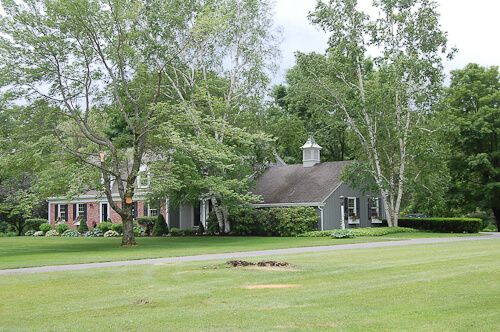 Dutch Colonial style was popular in the prewar period. But I am most certain this is a post war house because of the various Colonial Revival touches. I’m also thinking, prewar Dutch Colonials tended to be all brick, with less wood. More “Dutch/romantic” and less “colonial.” I am quite in love with this house. I might have to get all obnoxious and knock next time and ask for a tour. We moved into a 1954 mid-modest home a few months back and for the most part love it. Original tile and wood windows… One issue(s) however that I have, is that previous owners had inclosed the breezeway years ago making it an “office”, however they never properly insulated it, so now it’s a cold awkward dead space that is holding our unpacked boxes. I have tried convincing my husband of making it a breezeway again… My new solution (which is why I couldn’t sleep at 4am and writing this) is to knock out the brick enclosure in the front, and make it an inclosed screen porch (our laundry room addition is on the other side of the once said breezeway). Is that even possible? Would we need a permit you think? I’d love to see a post or here comments where someone has brought back an inclosed breezeway/ porch. Hi Karen, I don’t think we’ve ever discussed this topic before. To find out whether you need a permit, contact your local officials, they will know and can advise you.